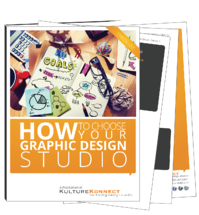 Finding the right graphic design studio can be like finding a needle in a haystack! There are too many options, from freelancers to small and large studios to specialized studios. Things can get overwhleming if you don't know where and how to start your research and what to look for when you start interviewing. Whether you are ready to move on from your current graphic design studio or have an in-house art department that doesn't have the capabilities -or time- to handle certain initiatives and projects, this checklist will give you a starting point and will contribute to your search and selection efforts. Download our check list to help you select the right graphic design partner.